When will be Freddy's Nightmares next episode air date? Is Freddy's Nightmares renewed or cancelled? Where to countdown Freddy's Nightmares air dates? Is Freddy's Nightmares worth watching? Freddy's Nightmares (full title: Freddy's Nightmares: A Nightmare on Elm Street: The Series) is an American horror anthology series, which aired in syndication from October 1988 until March 1990. A spin-off from the Nightmare on Elm Street series, each story was introduced by Freddy Krueger (played, as in the movies, by Robert Englund). After Paul scorns his lover, Claire, he resorts to drastic measures to ensure his family never learns of their affair. Later a guilt-ridden man who's trying to reconcile with his son learns that it's not possible to cheat death. In this follow-up to "Prime Cut", three recovering cannibals have an unfortunate relapse and wind up eating an intruder who's been afflicted with a strange disease. A priest who is giving the last rites to a woman on death row is seduced, and he plans an unimaginable escape from the death house with a tragic ending. Violet Rodriguez tries to escape the same way as the other prisoner tried, hopefully with better results. Andy Caulfield is a prisoner who is about to get parole, until he is faced with a prison counselor who also happens to be a relative of one of his victims. The second half centers on Warden Hendler, who is using prisoners as guinea pigs to test a new drug for extracting vital information, until the experiment backfires with drastic results. 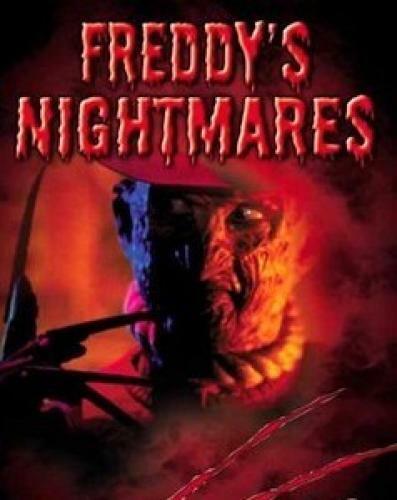 Freddy's Nightmares next episode air date provides TVMaze for you. EpisoDate.com is your TV show guide to Countdown Freddy's Nightmares Episode Air Dates and to stay in touch with Freddy's Nightmares next episode Air Date and your others favorite TV Shows. Add the shows you like to a "Watchlist" and let the site take it from there.